Goodfellows (1916), with social quarters at the corner of Green and Washington Streets, the B.P.O. Elks, on the third floor of the Citizens Bank Building at the corner of Baltimore and Centre Streets, the Lafayette Club in 1920, on the second floor over the Capitol Theatre, the Loyal Order of Moose in 1910, at 57 Baltimore Street, the Fraternal Order of Eagles in 1902, at 50 Baltimore Street, the Pelican Club in 1898, on Baltimore Avenue near Goethe Street, the Shawnee Canoe Club, with a boathouse and clubhouse in Riverside Park along the Potomac River, organized in 1896 and disbanded in 1927, the Silver Leaf Dancing Club, organized in 1902 with 30 members, which had their headquarters in Robert's Hall on Virginia Avenue in South Cumberland, and Crescent Hunting and Fishing Club, organized in 1902, which had a yearly camp along the Potomac River for about two weeks during July and again for a short stay over Labor Day. This club had social quarters on Bow Street near North Mechanic Street and would meet socially on Sunday's the year around. The club disbanded in the late 1920's. The Cardinal Athletic Club, with social rooms in Miller's Hall in the rear of North Centre Street, also had a summer camp along the River near Paw Paw, West Virginia. It started first with a tent, and later on its own ground built cabins and other buildings. This club had its own band of music composed of some of the finest musicians in Cumberland. This club was organized in 1907 and existed until 1969. The Potomac Club organized in 1904. It had its clubhouse in the old Perry Mansion on Carpenter's Hill in Ridgeley, West Virginia. From its clubhouse a striking view of Cumberland was afforded. 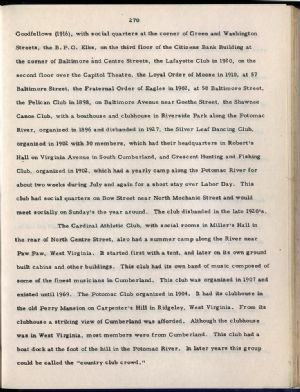 Although the clubhouse was in West Virginia, most members were from Cumberland. This club had a boat dock at the foot of the hill in the Potomac River. In later years this group could be called the "country club crowd."